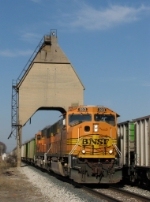 Description: BNSF 8920 leads a loaded UCEX into Old Monroe, Mo. Description: Two SD70MAC's on the point and two more on the rear drag a 128-car loaded coal train toward Pueblo, CO. Description: CSX train N841 off BNSF, is NB on CSX's Toledo Terminal Sub. Description: BNSF Coal Loads doing 60 easy, blast through the trees and over Mississippi St in a matter of seconds. Description: N903 sits in Wells Siding, waiting for a new crew to head to Consumers as D802. Description: BNSF coal train from Wyoming heads eastbound through East Lansing heading to Plymouth and then north to Flint. Description: CSX N956, enroute to Essexville, heads east up the grade at Harrison road with a customary pair of BNSF SD70MACs. Description: I saw that he was taking my picture so I took his picture. He later gave me a thumbs up. Description: E950 rolls onto the NS as 3 kids just look as the train as its nothing. Description: Destined for the Columbia, WI power plant. Description: Another string of empties moves west at sunset. 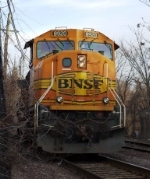 Title: BNSF 8920 River Sub. Description: CP Train 882 rolls through the S-Curve on a Beatifull July Day. Description: Q393 heads through Bloomdale with a wonderful Lasup! Description: BNSF 5871 and BNSF 8920 leads a short Z train eastbound into Rochelle. The train will very soon cross the UP's Geneva Subdivision. Description: NHB-08 the first bow coal train to have foreign power crusies out of Fitchburg and into North Leominster. Description: Foreign Power in Lowell, MA.